I just finished reading Donald Norman’s ‘The Design Of Everyday Things’ and here are my thoughts on it. The author talks about a lot of enlightening concepts and I will summarize them as I understand them. There is plenty of other interesting stuff in the book that I have not covered here, including great pictures, and I would strongly urge you to read the book. Natural mapping: The author says that when designing systems, you should make use of natural mapping. What does it mean? 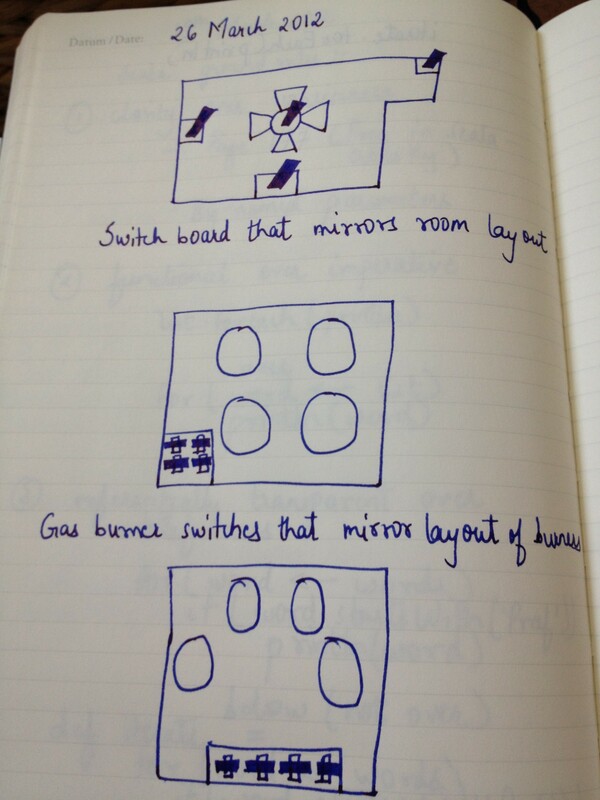 For example, lets say you were designing the switch board for electrical appliances in a room. One way and the common way to do it would be, to place all switches in one straight line. Now, this means, that the user has to remember, which switch does what. If you use natural mapping, you would design the switch board in such a way that the switch position on the board mirrors or maps the physical location of the appliance it operates in the room. This way it is very intuitive, which switch goes to which appliance in the room. Another great example is the gas burner switches, that I struggle with almost every day. I can never remember, which switch is for which burner. The author suggests some beautiful designs to map the actual burner position to its switch. Doors are a source of constant pain when operating. Wouldn’t it be nice to have a flat plate on the side of the door that needs to be pushed to be opened and a vertical bar for ones that need to be pulled. Why is it so hard? Any way, another nice example of natural mapping, that I have encountered on a Mac is, you see the Caps lock light located on the button itself. Sweet, no more searching! Knowledge in the head versus knowledge in the world: This concept is complementary to the natural mapping one. If you make use of natural mapping, like having a switch board that mirrors the physical layout of the room, it reduces the burden on the person to hold the knowledge in the head of what switch does what. On the contrary, you are putting that information out in the world! A great benefit of this is reduced learning curve for everybody, when dealing with new switches. Feedback: The author talks about how important it is for the system to give the user feedback, for the action they have performed, to assure that they have completed the task successfully. You do not want people sitting there thinking the machine is doing something when it is doing nothing or even vice versa. Feedback can be provided by sound (buzz when the microwave door opens), lights (caps lock is on), tactile (pressing a button on a telephone), et al. These are examples of feedback provided after an action has been performed. One of the examples that the author gives, is for providing feedback, even before an action is performed. This is about designing aircraft switches for landing gear and wing control, which I thought was ingenious given the risk involved in flying an airplane. He suggests that we create the landing gear switch shaped like a tire, whereas the switch that operates the wings shaped like a flat plate. When the pilot is working with these switches, the tactile feedback of touching a flat plate versus a round knob would have a much bigger chance of reducing error as opposed to having both the switches feel the same, especially in pressure situations. Constraints and forcing functions: Constraints can be used very effectively to better design products. For example, keys for locks are designed in such a way that it goes in only one way, which is a constraint that is built into the system to avoid making errors. Computer programs do this well these days with disabling certain options on the screen when they are not applicable to the user. Washing machines do not let you open the door when the system is running to avoid possible mishap. The author talks about other types of constraints like cultural constraints. An example of this would be when creating a LEGO model of motorcycle driver, the user knows to build the model with the motorcycle driver facing forward because it is the only possible way the driver can drive safely. The author issues a word of caution in using constraints because sometimes they can be a source of annoyance. You would know what I am talking about, if you have been in a situation where you are carrying stuff in your car and you place a heavy bag on the passengers seat and the seat belt buzzer goes off when you start driving the car. It would be dangerous if the driver permanently disabled the passenger seat belt warning. What I have seen happen is that the seat belt warning beeps for a while and then displays a warning on the dashboard to indicate the non-compliance, which is not so annoying. So what do I think of the book? I think it is great. It is very insightful. I got a little lost in the middle where it starts to talk a lot about psychology but there was always something that piqued my interest. The other thing I liked about the book is the book itself. Its nice and concise with 200 odd pages. I think books with about that size are perfect. They are easy to carry around, not too long yet enough to give a good understanding of about anything in the universe. When I first started reading the book, I thought all these issues were minor, trivial or first-world problems1. Then as I started thinking more about it, I realized how important the problem is of fixing the usability of everyday things like train doors, aircraft switches, car windows, gas burner switches, et al. The problem only gets worse when you think of operating these devices in a panic situation. We have been producing fantastic devices until now but not paying a lot of attention to usability and I think that should be one of our top priorities going forward.